I was in New York City in 1998 when I first heard Amiri Baraka introduce and read one of his low coup poems. Over the years, I heard him describe his low-coup as short like haiku, but "dagger-like" in tone and sentiment. Black people, he once joked, are too lazy to count syllables; thus, his use of "low" instead of "hai" (i.e. high). And rather than "ku," he chose "coup" to suggest a rebellious uprising. That idea of a punchline in the low coup made them especially entertaining for audiences when Baraka would read the poems live. Often, he would hum bits and pieces of Bud Powell's jazz tune "Un Poco Loco" as before and during readings of each of the low coup. Baraka would often inform his audience that the title of Powell's song meant "a little crazy." In April 2002, I attended a concert/reading where Baraka performed his low coup with jazz musicians Archie Shepp, Reggie Workman, Roswell Rudd, and Andrew Cyrille. The musicians played Powell's tune as Baraka read his short dagger-like poems. At a reading in 2003 (I think), I purchased a hand-made collection that Baraka had made of his short poems. The little stapled collection is entitled Un Poco Low Coup, which demonstrates Baraka incorporating Powell's "Un Poco Loco." The book was published by Baraka's own publishing operation Razor. The booklet includes Baraka's poems and his black and white illustrations. The pamphlet includes 35 pages. 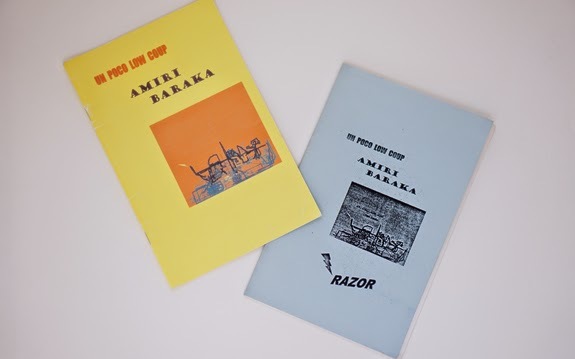 At a reading in 2005, I picked up another version of Baraka's short poems, this one entitled Un Poco Low Coups (2004). Note the addition of the "s" after "Coup." This version was published by Ishmael Reed Publishing Co. in Berkeley. This version reprints almost all of the works from the previous pamphlet, except this version includes 25 pages. Baraka's illustrations are also in color for this one. Some of the words in the first version are harder to make out because of the quality of the scan and transfer. Also, some of the writing is handwritten, not typed, so reading the first version means, at some points, deciphering Baraka's handwriting. Of course, those aspects of the book make the work seem even more personal. 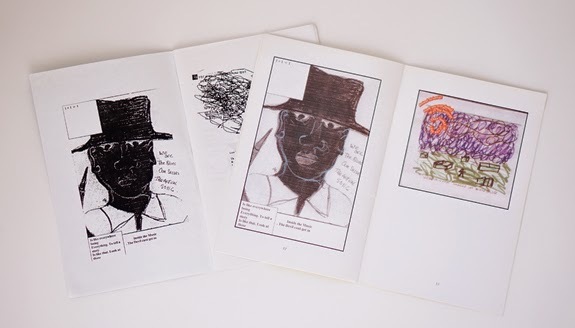 In both books, Baraka has a drawing of a man wearing a hat and the handwritten lines "We are / The Blues / Our Selves / The Actual SONG." I recognize those lines from Baraka's poem "Funklore." I read them on the pages of Un Poco Low Coup and Un Poco Low Coups as a stand-alone low coup, but also as merely a note in a visual artist's sketchbook. These little books, not to mention Baraka's larger body of work, give me many ideas on how his mind was working in many modes and directions.